Today’s guest is speculative fiction writer and Byzantine historian Arkady Martine! She has written short fiction and poetry for various publications such as Uncanny Magazine, Shimmer, and Mithila Review, including her stories “The Hydraulic Emperor,” “All the Colors You Thought Were Kings,” and “Ruin Marble.” And just a couple of weeks ago, her debut novel was released—A Memory Called Empire, a space opera and the first book in the Teixcalaan series! A few weeks ago, a friend of mine—another woman with a debut science fiction novel coming out in the next year—spoke out on social media about the pernicious and awful reaction she’d had from some members in her community when she announced that she was pregnant: these people immediately asked her when she was planning on giving up her just-begun writing career. As if the very presence of a baby would automatically mean she wanted to stop writing. The righteous anger and the fear that I felt, when I read about her experience and her determination to be a mother and an author both, at the same time, has stuck with me. I keep thinking about how often women, especially creative women, especially creative women in a field which demands time commitment away from the realms of ‘day job’ and ‘housework’, are presented with this expectation that pregnancy and motherhood is a goal that wipes out all other goals. And about how that expectation both devalues creative work done by women—oh, it’s just a hobby, a little amusement before the proper work of being a mother begins—and devalues the work of motherhood, too. Because motherhood is work, and growing a human being inside a body is physical work of profound difficulty. The idea that all women are naturally—and please do imagine the scare-quotes around “naturally”—aspiring towards the ultimate state of pregnancy and motherhood, and that because it is ‘natural’ it is easy, is another kind of pernicious and awful. I felt anger on my friend’s behalf, and on the behalf of every woman who decides to be a mother and a creator both: they deserve a better cultural narrative. And I also felt fear, because I am a woman who doesn’t want to be a mother…for many reasons, but amongst them is the terror of losing myself, my creative ability, my independence, and my physical health. This anger and this fear have been with me a long time. I found them as a young teenager, and I found them in science fiction, which is the genre I work in and the genre I read most often. 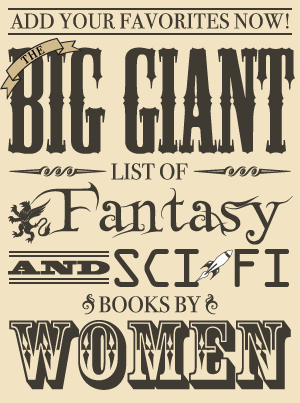 Certainly, the genre that helped form my sense of narrative…including my narratives of motherhood. In my own recent debut novel, A Memory Called Empire, I found myself grappling with the problems of motherhood in science fiction, all despite my own intentions. I was writing a political thriller! My protagonist pretty much never thought about having a kid—she’s too busy trying to solve a murder and prevent the imperialist annexation of her home mining station! But so much of the novel turned on questions of inheritance—the inheritance of memory, of power, of culture, of genetics—that I quickly realized that I needed to think about parenthood. Of motherhood, specifically, because I was writing a culture where I wanted gender roles to be downplayed and mostly insignificant in terms of career paths and societal functioning. And this meant I needed to think about pregnancy. I think my first experience of motherhood narratives in science fiction was in Heinlein’s The Moon Is A Harsh Mistress—where I, age 12, was disturbed by how the heroine Wyoming Knott was so eager, at the end of the book, to have babies; as if she’d been waiting all along for the politics to be over so she could fulfil her deepest desires, hitherto mostly invisible to the reader, but somehow inevitable in the author’s imagination of How Women Worked. In general women in Heinlein novels have babies as often as they can, and they all like it, and they all find it easy, and they all want it as an end-state goal. Small me—queer, dubious about human beings, especially ones who you had to take care of all the time—found the whole concept profoundly alienating. 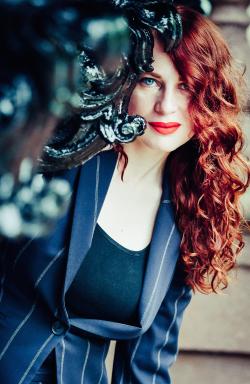 If being one of Heinlein’s brilliant redheads meant desiring motherhood at a blood-deep level, then I wasn’t one, red hair and cleverness aside. And then I found Lois McMaster Bujold’s Vorkosigan books, and a whole different—if equally essentialist—conception of motherhood in science fiction. One which both made much more sense to me (of course if you could have a baby in an external womb you would! Pregnancy is hard, dangerous, and debilitating!) and kept bothering me…because, in the words of Cordelia Naismith Vorkosigan, in the universe Bujold has constructed, all wealth is biological. Having children—continuing lines of genetics, which create lines of loyalty, networks of cousins and family that span planets and can, at times, stop wars—is a primary and necessary form of doing politics. And because women (in the Vorkosiverse—it’s far more complex in the world out here) are the ones who biologically produce children, even if they’re grown externally, there is an explicit linkage between being a woman and being involved in producing biological wealth. And this, too, I found alien. Not the politics of genetics and loyalty, those made sense to teenage me…but the idea that this was what women were for. And yet, children are something that many women—and men, and nonbinary people—want. The project of children, the project of raising a human being, of making one. And even though I still don’t want one myself, I want the choice to produce one, to devote some of one’s power to the project of motherhood, to be a choice, and thus a choice which can be valued, held up as an achievement, a brave, fascinating, interesting thing to do. So when I came to write my own science fictional universe, I found myself writing a character, Five Agate, who had a very powerful position—she’s the chief analyst on the staff of one of the Emperor’s closest advisors—and a young child, six or so years old, who she is raising while continuing to be on call nearly twenty-four hours a day. And because in the universe I had built, I had also chosen to decouple the growth of fetuses from the bodies of people with uteruses—my universe has ubiquitous artificial wombs, crèche-style childcare, and universal contraception for everyone, no matter their gender—I wanted Five Agate’s choice to have a child to not only be a choice about work but a choice about her body. So I had her carry her son in her own womb. Which, on Teixcalaan, is like choosing to run a marathon. No one does it without physical training and profound preparation! It’s considered a real and amazing feat, to carry a child to term and give birth to it! Five Agate trained for two years to get ready, and she is so proud of herself, and of her son. And people who run into her are as amazed at her accomplishment as people here on Earth are amazed at ultramarathoners. Teixcalaan’s no paradise of genetic legacy, and it is full of problems relating to succession, families, and inheritance. But Five Agate is one part of that world: and through her, I wanted to write someone who could make my friends who have made the fascinating, brave, and interesting choice of having a child feel recognized and valued. Arkady Martine is a speculative fiction writer and, as Dr. AnnaLinden Weller, a historian of the Byzantine Empire and a city planner. Under both names she writes about border politics, rhetoric, propaganda, and the edges of the world. Arkady grew up in New York City and, after some time in Turkey, Canada, and Sweden, lives in Baltimore with her wife, the author Vivian Shaw. 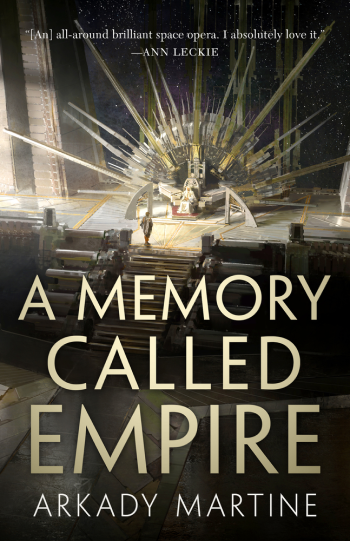 Her debut novel, A Memory Called Empire, was released in March 2019 from Tor Books, and is available here. Find Arkady online at arkadymartine.net or on Twitter as @ArkadyMartine.